Crude prices are flat/higher today after hardly moving yesterday. The API’s report of a small stock draw helped pull the market out of some early losses, but prices were unable to rise higher. Today, crude oil is currently up 26 cents, trading at $61.94. 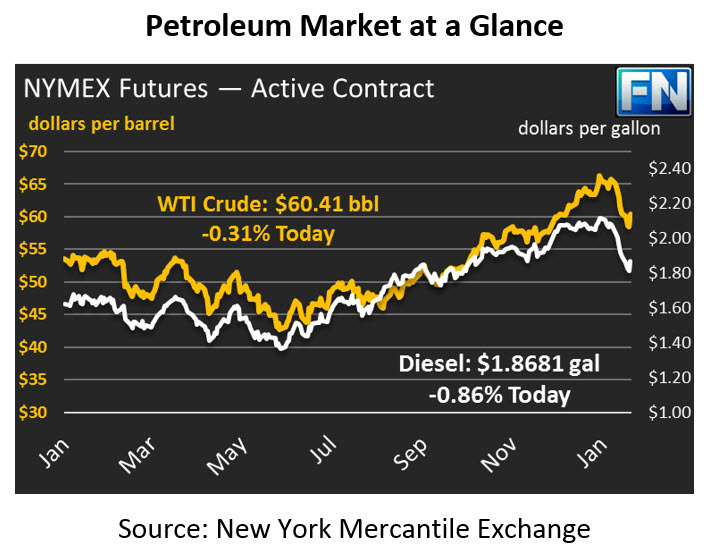 While crude oil only gained 5 cents/bbl yesterday, refined fuels had a better day. Diesel prices rose by over a penny, while gasoline prices fell just shy of one cent gains. Today, both are trading mostly flat. Diesel prices are currently, $19.357, a gain of 0.3 cents. Gasoline prices are flat, trading at $1.7572. Markets received a boost in the afternoon yesterday thanks to the API’s inventory report, which showed declines in crude and diesel stocks. Although gasoline posted a surprise build, the overall trend was supportive for prices. The API and EIA inventory reports were each delayed by President’s Day on Monday, so the EIA will release their report this morning. It’s worth noting that in recent weeks, the trend has been that when API and market consensus diverge, the EIA report tends to align more closely with market expectations. We’ll see if that trend holds true today. The Brent-WTI spread has narrowed throughout February, yet exports continue. The spread represents the difference between a barrel of Brent (international) crude and a barrel of WTI (U.S.) crude. When Brent prices are much higher than WTI prices, U.S. producers have a strong incentive to export and sell at the international price – why accept $60 when you could earn $65 by exporting? That spread has narrowed from $5-7 dollars late in 2017, and has been $3-4 in February. Despite narrowing spreads, crude exports remain elevated relative to early 2017 – as we mentioned recently, America even flexed her muscles by opening a deep water port with room for ultra large tanker ships.